John Bongiovi, Sr.—yes, that’s rocker Jon Bon Jovi‘s dad—is spilling his family’s secrets. Well, family cooking secrets, that is. 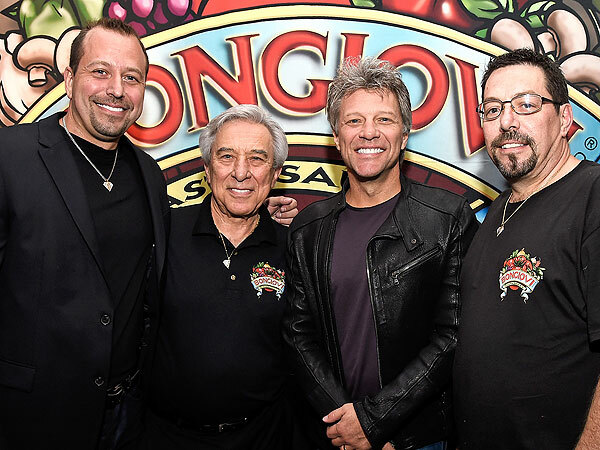 The father of three sons (above, l-r, with John Sr. at center left) Anthony, Jon and Matthew, is the founder of Bongiovi Pasta Sauces, which is modeled after his longtime Italian family recipe. The homemade sauce is a staple in the Bongiovi household, with the patriarch whipping up recipes using the marinara. In this week’s issue of PEOPLE (on newsstands now), we caught up Bongiovi, who shared a beloved dish and dished on his famous family. RELATED: What Is Emeril Lagasse’s Most Requested Recipe After 25 Years in the Business? How did you go from making this sauce for Sunday dinners to bottling and selling it? How long has your sauce recipe been in the family? What dish does Jon ask for specifically? 1. Preheat oven to 400°. Beat 5 eggs in a bowl. Dip sliced eggplant into eggs, then bread crumbs, to coat thoroughly. 2. In a large skillet on medium high, heat ½ cup vegetable oil and ½ cup olive oil. Add 3 to 4 eggplant slices and cook until browned, about 2 minutes per side. Transfer to a paper-towel-lined plate to absorb excess oil. Repeat until half the slices have been cooked, then discard oil and wipe pan with paper towels. Heat remaining 1 cup oil and cook remaining eggplant in batches. 3. In a skillet, sauté the sliced mushrooms in 1 tbsp. olive oil until soft, about 7 minutes. Add garlic, 1 tbsp. oregano, 1 tsp. salt, ½ tsp. pepper and ½ tbsp. thyme. Cook for another 2 minutes, then set aside to cool. 4. In a large bowl, thoroughly mix ricotta cheese, 3 eggs, ½ cup grated Parmesan, spinach, the mush- room mixture and remaining oregano and thyme. 5. Spread 1 cup marinara sauce in a 9×13-in. baking dish. Layer a third of the eggplant slices on top, overlapping the pieces slightly. Add half the ricotta mixture and then 1 cup marinara sauce on top. Repeat with another layer of eggplant, ricotta and sauce. 6. Top with final layer of eggplant and 2 cups marinara sauce. Sprinkle with shredded mozzarella and remaining ½ cup of Parmesan. 7. Cover with aluminum foil coated with cooking spray, and bake for 1 hour. Remove foil and continue baking for an additional 15 minutes, or until sauce is bubbling and cheese is melted. 8. Remove pan from oven and let rest for 15 minutes before serving. Sprinkle with basil leaves, cut into squares, and serve. 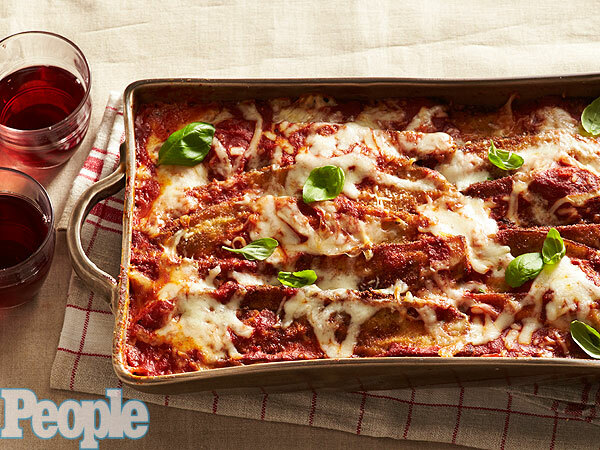 For more on the Bongiovi family’s recipes, pick up the current issue of PEOPLE, on newsstands now.